Yes! Rush me Dr. Iverson’s brand new CD, The Negative Self-Talk Eliminator so I can begin today to eliminate destructive self-criticism, negativity, guilt and depression and take control of my mind and the direction of my life. Your browser does not support the latest method of video streaming. Please upgrade to the newest version of your browser. Because You are Ordering Today, You are also Eligible to Receive a One-Time-Only Discounted Offer! 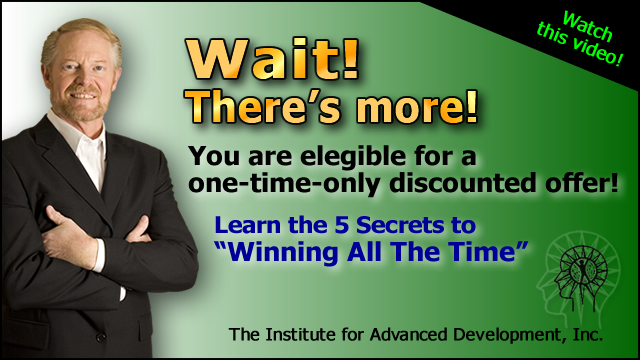 Since you are ordering today, you have the opportunity to Upgrade your Negative Self-Talk Eliminator purchase to include my success boosting Audio Program — “Winning All The Time” for a savings of 40% OFF of the normal retail price. This is a one-time offer and will not be repeated EVER! This discount is good only for today. 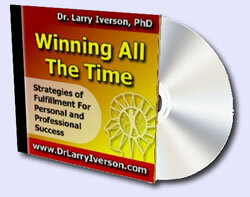 Using the Winning All The Time CD will launch you toward your success! People say you can’t win all the time. YET there are people who are consistent winners! You can be one of them. Learn to control the 3 aspects of yourself that will give you control over your personal and professional life. On Winning All The Time you’ll learn proven strategies to manage your internal state, your thinking patterns and the usage of your physiology. Have you ever felt overwhelmed from all you have to do? Have you ever procrastinated? Have you ever felt down and just couldn’t shake it off? Have you ever had goals you want to achieve but just couldn’t pull it off? Here’s something you can do about it now! This one-time offer is a perfect addition to The Negative Self-Talk Eliminator. By applying the strategies you will learn in Winning All The Time you will feel more alive and energized, decrease stress so you don’t burnout, boost your enthusiasm and motivation and much more. Don’t miss this one time offer! I want to purchase both of these programs, knowing this is a one-time offer, valid for today only. I only want to purchase and download the The Negative Self Talk Eliminator CD.